Much has happened in the Gun camp since they released their masterpiece Taking On The World in 1989 and were hailed as the next big (Scottish) thing. That album spawned no less than five big hit singles and the future looked very bright for the band. But when the very underrated Gallus saw the light of day back in 1992, the band didn’t manage to ride on the success of the predecessor. Not that the album was a big failure, but it didn’t put the band on the next level and when they released their third album, the amazing Swagger, we wrote 1994 in our calendars and grunge and alternative rock had taken over and even though Gun never was a glam, sleaze or AOR band, they were looked upon as a melodic hard rock band and the winds just didn’t blow that way back then. They gave it a try one final time, changing the name to G.U.N. and made some kind of dance record called 041 632 6326 in 1997, but the album bombed completely. Which wasn’t a surprise as the album sucked and the Gun fans that were still behind them didn’t dig their new style. The band split shortly after that album was released and the hiatus would be consistent until 2009 when the band reformed, minus original singer Mark Rankin who was replaced with former Little Angels singer Toby Jepson. However, that line-up didn’t last longer than one E.P., 2009’s Popkiller, because in 2010, Jepson quit and it was decided that original bass player Dante Gizzi would take the place as the lead singer. That left Dante and his guitar playing brother Giuliano, aka Jools, the band’s sole original members. In 2012, the band released their first long player in 15 years, the brilliant Break The Silence, an album that I hold as Gun’s best effort since the debut. But just like many, many bands today, things get terribly quiet after an album release and if you’re not searching hard enough, it’s hard to get any information of the band’s whereabouts. For example, I had no clue that Gun were about to release a new record until I visited a music forum where one person pointed out that he had heard the album. Of course, being such a fan of the band’s last record and the band in general, their new album was a must-hear and, of course, a must-review for me. And I kept my fingers crossed that I had put my hands on yet another Gun killer (sic!). Opener “Let It Shine” made it clear that all worries were unnecessary. Not much more to say about the song than it’s awesome, big melodic rock with a contagious melody and a beat that makes it impossible to sit still to. First single “Labour Of Love” is a true Gun swagger, complete with a groovy horn section and the catchiest of melodies. “Beautiful Smile” comes across like a melodic rock Led Zeppelin, a brilliant tune that has great live potential. “One Wrong Turn” has those classic Gun melodies and I’m actually thinking of albums such as Taking On The World and Gallus when I hear this. A groovy melodic rocker and very much a Gun tune! “Our Time” is an upbeat ballad, very good with a big hit feel and I would strongly advise the guys to release this as a single / video at some point. Both the album’s title track and the following “Hold Your Head Up” are catchy pop songs, the former a little darker and big on the keyboards and the latter is more of a nicer pop song, but both are catchy as can be – and both are awesome. “Big City” shows off some punky riffing, but the song itself is a melodic hard rock / pop song, but the mix of the two makes it interesting and the song is really, really good. “Seraphina” takes us back to the debut album once more, a great pop-rocker that is classic Gun all the way through – the song is just damn brilliant. They leave us with a fantastic ballad called “Never Knew What I Had”. It sounds very radio friendly and mainstream – yes, it will have a good chance making it as a mainstream hit – but at the same time it has all the ingredients that Gun have always had in their music – mostly the melodies. Gun have always written their melodies in their own way and it is the melodies that gives them their own sound. To make it easy on people, if you liked their previous album, you will like this one as well – unless you’re completely schizophrenic. The cool thing with Gun is that the latest line-up has gone on a new musical journey where they are going out and trying to find new things, but they still sound like Gun. Gun, to me, were always a classic rock band that had one foot in hard rock and their three first albums had their own style – it’s easy to hear after just a second or two that you’re listening to a Gun song. 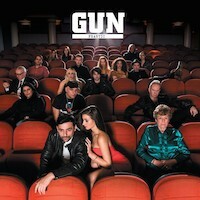 Today, Gun lies more in the melodic rock vein – not to be confused with AOR, glam or sleaze – with lots of pop influences and both keyboards and horns added to the mix, but everything still sounds like Gun. To be perfectly honest, their debut excluded, I actually prefer the this album and its predecessor to the older Gun records. Added to the fact that Gun has always stepped over the hard rock and metal border musically, reaching out to fans that might not be hard rock fans, it’s a complete mystery that this band isn’t huge by now. The way I see it, if a band like U2 can get ultra big, a band like Gun should also have a big shot at that kind of stardom. The fact that this lot is playing clubs is a joke. One look at the video below should be enough for every fan of melodic hard rock to go out and buy this – and their previous – album. Trust me on this, peeps, you need this album.